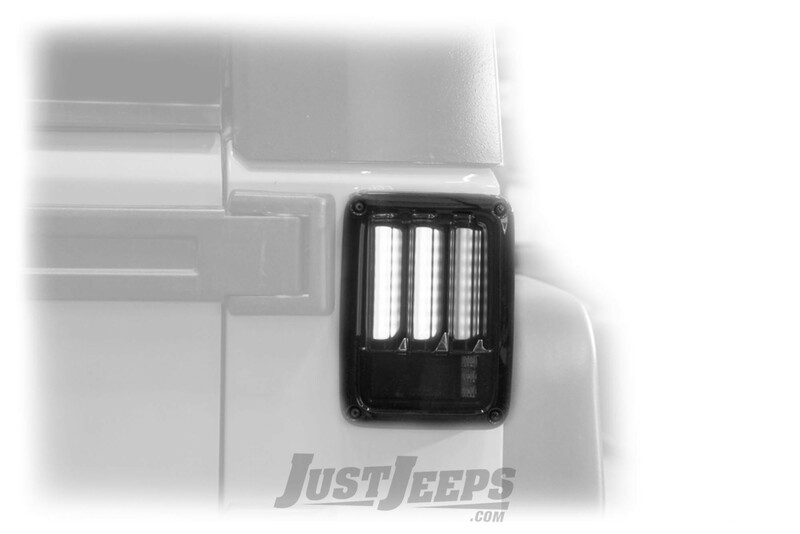 Just Jeeps Buy Spyder Automotive Sequential Fiber Optic LED Tail Lights For 2007-18 Jeep Wrangler JK 2 Door & Unlimited 4 Door Models for CA$328.95 | Jeep Parts Store in Toronto, Canada. These LED tail lights from Spyder are a great way to start your vehicle on the path to exclusivity. For a small amount of cash, time and effort these lights will transform the back of your chariot and give it a look that’s far from what rolled off the assembly line. The designers at Spyder create their lights for each specific make and model, ensuring that the styling will be much more interesting than what the factory imagined but at the same time complement your vehicle’s fine lines. These lights include the style, superior illumination and added safety that you can only get from LED lights. LED lights are the most advanced form of lighting. Their compact size makes it easy to arrange them in distinctive patterns, as seen on many late model luxury cars. They’re extremely durable, with an average lifespan of 50,000-336,000 hours, which means they’ll probably outlast the rest of your vehicle. The light they produce is much brighter, cleaner, and more attractive than incandescent light. Though, these are not just LEDs but also fiber optic strips that provide amazing illumination. Due to the utilization of fiber optic instead of standard bulbs, the lights are vibration-proof and therefore can boast of an exceptionally long service life as well. Furthermore, fiber optic materials neither produce heat and IR or UV rays nor contain mercury, making the product completely friendly to the environment and human beings. Every Spyder tail light undergoes a rigorous testing and quality control process before it leaves the factory. All wiring is tested to make sure the light is completely functional, and the housing is sealed with high quality silicone to ensure that no moisture can become trapped inside. Please check your state regulations to make sure whether smoke lights are street-legal. Spyder tail lights are designed to exactly replace your factory lights, however some electrical wiring work may be required. Most lights come with detailed instructions to guide you through the installation.